Lying at the mouth of the Kromme River, and situated in the Kouga district of the Eastern Cape, St Francis Bay is known as the ‘little Venice’ of the Eastern Cape, and is surrounded by the surfing paradise of Jeffreys Bay, the Gamtoos River Valley, Tsitsikamma and the Baviaanskloof Wilderness Area. This magnificent Eastern Cape reserve offers nature lovers a unique wilderness experience, with colourful cliffs and rock formations, 1000 different plant species, and a rich and diverse animal life including Cape Leopard, Cape Buffalo, Kudu, Cape Mountain Zebra, Red Hartebeest, Bushbuck, Mountain Reedbuck, Eland and Baboon. 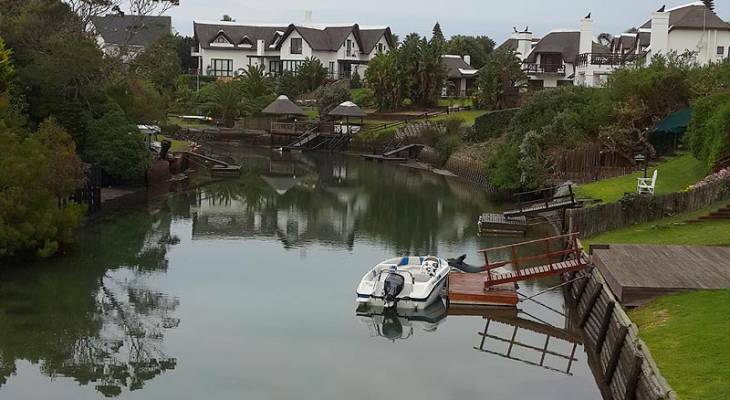 The charming little holiday village of St Francis Bay is built around a series of man-made canals and waterways, perfect for boating, swimming and other water sports. On one side of the privately owned Port St Francis harbour a fleet of squid (chokka), hake and pilchard vessels are berthed, while leisure yachts and recreational fishing boats are moored next to magnificent black roofed, white walled thatched homes set right on the waters of the St Francis Bay canals, where you can fish from your front lawn! The more active have plenty of other activities to choose from in St Francis Bay, as in surfing, kite boarding, wind surfing and paddling to trail running and mountain biking. When surfing the web on Where To Stay, you'll find Star Graded St Francis Bay Bed & Breakfast accommodation set amongst lush, indigenous milkwood trees, and St Francis Bay Self Catering accommodation located on St Francis Bay Golf Club - rated as one of South Africa's top 18 hole golf courses. If golf is your passion, this superb Eastern Cape golf club won't disappoint. Visit the Where To Stay St Francis Bay accommodation page for more info. St Francis Bay offers you a deluge of fabulous restaurants to chose from, where you can enjoy generous breakfasts, light lunches and gourmet dinners. Try something Greek at the Big Time Taverna, an authentic Greek restaurant situated on the canals, where you can sit outside on a summer night and enjoy delicious food, wine and speciality drinks such as Ouzo and Metaxa Brandy. For the seafood lover, Loligos Seafood & Grill overlooks Port St. Francis harbour and the Indian Ocean, providing spectacular ocean views. Playground to dolphins and whales, the glorious beaches, open-markets, restaurants, shops and 'well-to-do' leisurely lifestyle makes St Francis Bay the ideal Eastern Cape holiday destination. The name 'Paradise Beach' says it all. This small Eastern Cape holiday destination truly is paradise, with the warm Indian Ocean sweeping onto long stretches of golden Eastern Cape beaches, surrounded by nature reserves and picturesque estuaries. Separated only by the Seekoeirivier (Hippopotamus River) lagoon, Paradise Beach is regarded as an extension of the ever popular Eastern Cape, Jeffreys Bay surfing mecca, where the 'super tubes' attract surfers from all over the world. Yet, while development and accommodation in Jeffreys Bay has mushroomed, Paradise Beach still maintains its 'sleepy town' atmosphere, with swathes of untouched land inhabited by an amazing variety of birds. Here life is easy-going, laid-back and mellow, governed by the sun, waves, and the dolphins and whales cruising the Eastern Cape coastline. Besides surfing, Paradise Beach offers many water sports such as kite boarding, windsurfing and jet-skiing. And of course, there's swimming, tanning or just taking a long leisurely walk on Paradise Beach. If it's not ideal beach weather, there's hiking in the Eastern Cape Seekoei Nature Reserve, home to a huge variety of bird species and wildlife, where you can also braai in the lapa, while taking in the abundant natural Eastern Cape beauty. For a unique dining experience in an charming, eclectic ambiance, Potter's Place Restaurant in nearby Jeffrey's Bay is where you can indulge in the best calamari in town, while watching a live show. Then browse to your heart's content in the gift shop, where you can find custom made items by artists from all over the country. Jeffreys Bay is considered the surfing jewel of the Eastern Cape. Rated among the ten best surfing spots in the world, Jeffrey's Bay or 'J-Bay' as it's known to the locals, is host to the Billabong Surfing Festival every July, and is a paradise of sunshine, classic reefs, scuba diving, fishing, sailing, canoeing and body surfing. Visitors who find it hard to leave such an idyllic Eastern Cape spot have turned Jeffreys Bay into a year-round fun place to be, where one can savour the warm Indian Ocean, and enjoy the relaxed atmosphere of the endless Eastern Cape summer. Jeffrey's Bay Self Catering accommodation seems to be most popular, although there are a couple of Jeffrey's Bay Bed & Breakfast accommodation options for those shorter stays. For more info, check out the Where to Stay Jeffrey's Bay accommodation page. Jeffrey's Bay is a small bustling Eastern Cape town, making the beach, accommodation, internet cafés, shops and of course J Bay surf shops all within easy walking distance. A good selection of coffee shops, fast food take-aways and restaurants cater for every culinary taste - make sure you sample the treats from the Jeffrey's Bay bistro - Ozone Cafe, sure to "upsize your tastebuds and decadence levels". Beautiful Cape St Francis offers tourists year-round mild temperatures, that give rise to a never-ending list of water sports and activities that include swimming, jet skiing, deep sea fishing, water skiing, canoeing, windsurfing and yachting. Surfing along this stretch of Eastern Cape shoreline is popular with surfers from all over the world, as the exposed point break consistently remains quiet and peaceful all year round. Further out to sea, whales and dolphins can be seen frolicking in the Indian Ocean waters from August to December. Cape St Francis is famous for the old lighthouse at Seal Point that has stood guard over the rocky Eastern Cape shores since the 1800's, as well as the Cape St Francis Nature Reserve, which is a big draw for nature lovers. This 3km stretch of Eastern Cape coastal dune fynbos, milkwood and candlewood trees between the dunes is home to small antelope, vervet monkeys, otters, mongoose, and a spectacular array of birdlife, making the Cape St Francis Nature Reserve an enchanting Eastern Cape wonderland to explore. You will be spoilt for choice when looking for Cape St Francis accommodation, with Cape St Francis Self Catering accommodation situated right on the beach, and Cape St Francis Bed & Breakfast accommodation also with private beach access, where one can swim, fish or snorkel, while surfers can choose from several good spots, including the world-renowned Eastern Cape Seal Point, and nearby Bruce's Beauties. Oyster Bay is essentially for nature lovers, offering magnificent sand dunes which invite you to sandboard the slopes, woods, river deltas, lagoons, beaches and wetlands to hike, including other activities such as horse riding, mountain biking and fishing. A large part of the Cape St. Francis conservation efforts are geared towards saving the threatened African Oyster Catcher, a large black wader with red legs and an orange-tipped red bill. This charismatic bird makes the Cape St. Francis beaches its home, and is afforded the greatest respect with the controlled use of 4x4 vehicles and motorbikes. See the Where To Stay website for 'on the beach' Oyster Bay Self Catering accommodation, and luxury Oyster Bay Bed & Breakfast accommodation with stunning sea views. St. Francis Bay in the Eastern Cape lies at the mouth of the Kromme River, and is an ideal spot for whale watching. As a wildlife photographer, it's a delight to see the whales breeching in the Bay of St. Francis, and during September I rented a lovely self catering apartment in St. Francis Bay's residential marina development, known as "Little Venice," which overlooks the new Port St. Francis yacht harbour. These beautiful natural surroundings were ideal for my needs, and besides my daily whale watching trips to the Bay of St. Francis, there were many open-markets, restaurants and shops to explore. Besides the great St Francis Bay accommodation options, and among many other activities, the Eastern Cape's seaside village of St. Francis Bay offers excellent water-sports, and I have to congratulate myself, as for a first time kite surfer, I spent most of the time above the water skimming past the glorious St. Francis Bay beaches. That same evening I took a sunset cruise around the Bay of St. Francis, making new friends, and enjoying fresh calamari and chilled white wine. It was a wrench to pack up and leave this enchanting place, but it was time to move on to nearby Cape St. Francis, Paradise Beach, Jeffreys Bay, and Oyster Bay (a hamlet to the west of Cape St Francis), in search of more adventure photo's for my portfolio. St. Francis Bay overview. St. Francis Bay Accommodation and Information.